If entertaining is your thing, then look no further than the Coach RF series. Coach has taken this series to the next level by making what other builders offer as optional - a standard. 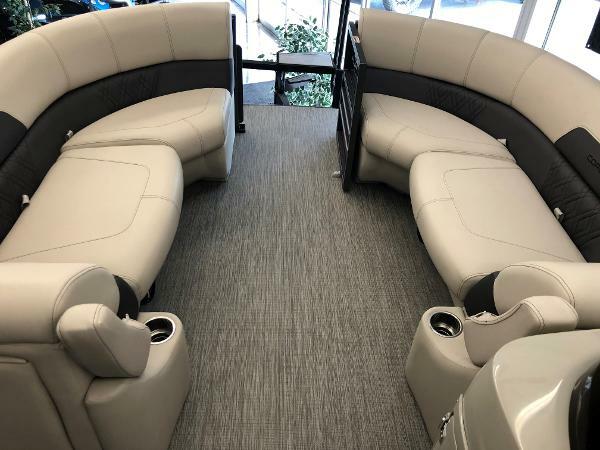 Our high back captain chairs (with adjustable seat pedestals), and lavish chaise lounges, will give everyone plenty of room to find their spot to lay in the sun. 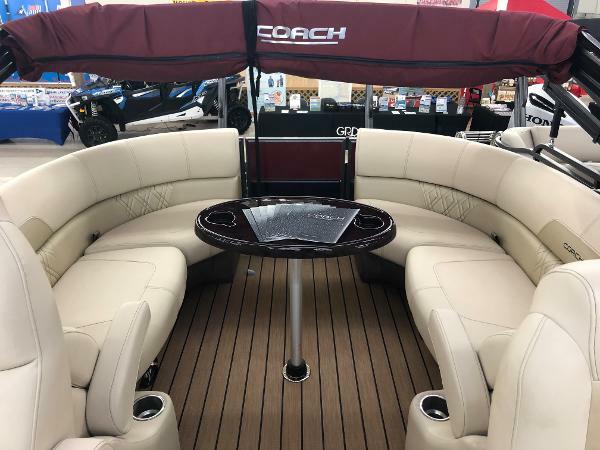 This beautiful all black Coach 230 RF is ready for immediate delivery! Call for special internet pricing. 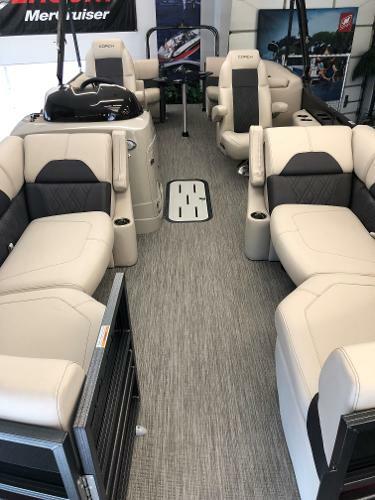 Options include: Woven Flooring Grey Furniture Package Extended Bimini Top Coach High Performance Upgrade 54 Gallon direct fill Fuel tank In-Floor Ski Locker Raised Helm RGB Exterior Lighting Package Blackout Edition w/Hammered Rails Hydraulic Steering & Power Assist Steering Ski Tow Bar Full Cover Custom Boatmate Trailer 10 YEAR WARRANTY!!! 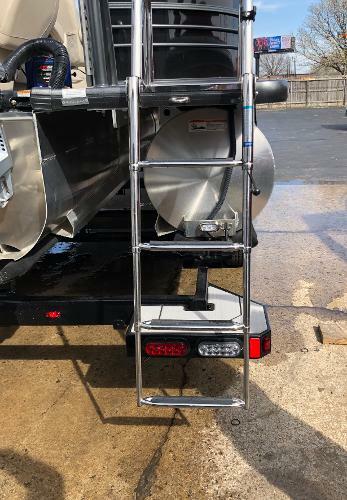 Standard Features: Multifunction Guages (NMEA 2000) Hammered Powder Coat Rails Rockford Stereo w/bluetooth and XM Sirius Bazooka LED Speakers/6"Bass Tubes Infinity AVD flooring (NO CARPET) Gussi Italian Tilt Steering wheel Stainless Four Step Ladder Stainless Cleats & Hardware Deluxe Fiberglass Helm Soft Touch Seating with arm rests Full Fitted, Snap-Free, Cover Anodized Black Bimini Frames Simrad Touchscreen GPS & Sonar Waiting for a good home. Call today to set up your demo. Trades welcome & Financing available! If entertaining is your thing, then look no further than the Coach RF series. 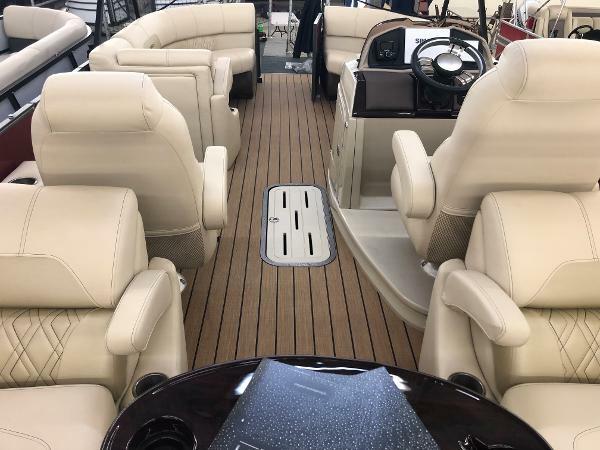 Coach has taken this series to the next level by making what other boat builders offer as optional - a standard. 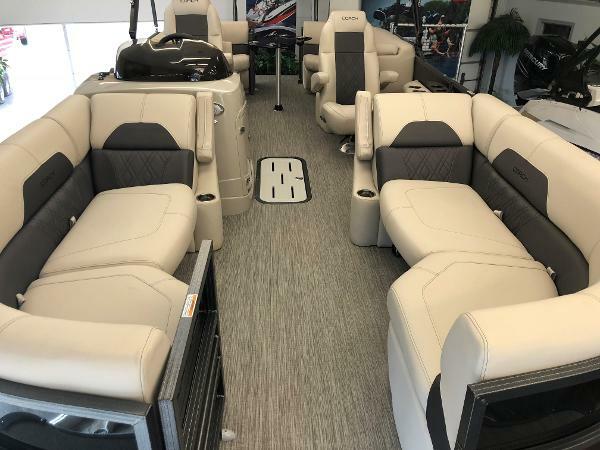 Our high back captains chairs (with adjustable seat pedestals), and lavish chaise lounges, will give everyone plenty of room to find their spot to lay in the sun. 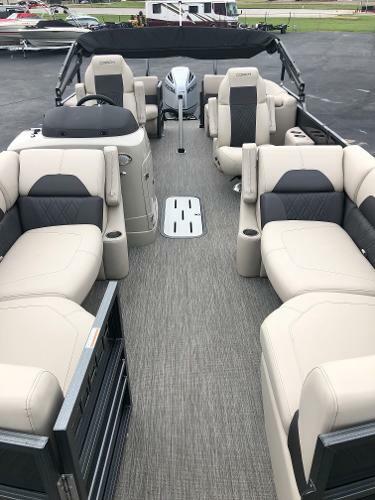 Options include: Extended Twin Bimini Top Blackout Edition Hammered Powder Coat Rails Black Anodized Bimini Frames Coach High Performance Tube Package 54 gallon direct fill fuel tank 4 lifting Strakes w/full length performance sheeting Hydraulic Steering and Power assist Steering In-Floor Ski storage Locker Raised Helm with LED lighting RGB Exterior Under Deck LED Lighting & Under water Package Multifunction Guages (NMEA 2000) Rockford Stereo w/bluetooth and XM Sirius Radio capability Bazooka LED Speakers/6" Bass Tubes Infinity AVD Flooring Gussi Italian Tilt Steering Wheel Stainless Four Step Ladder Stainless Cleats & Hardware Simrad Touchscreen GPS & Sonar Soft touch seating w/arm rests Large reinforced Ski Tow Bar Full Fitted, Snap-Free, Boat Cover 10 YEAR WARRANTY!!! 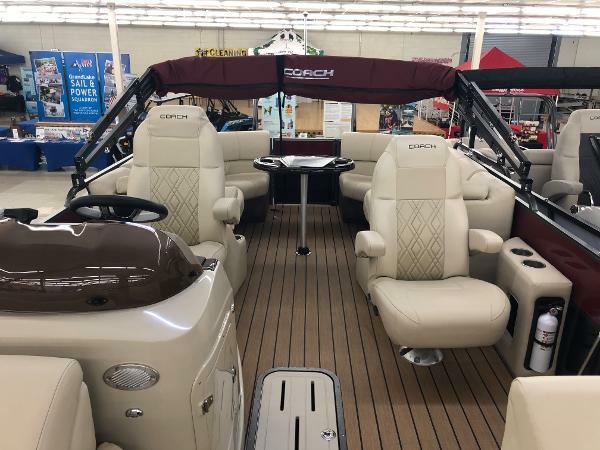 Owning a Coach Tritoon is one of the best value-added choices you can make as a boater, in that many of our high-end features come standard with our models. Call today to set up your demo. Trades welcome & Financing available! 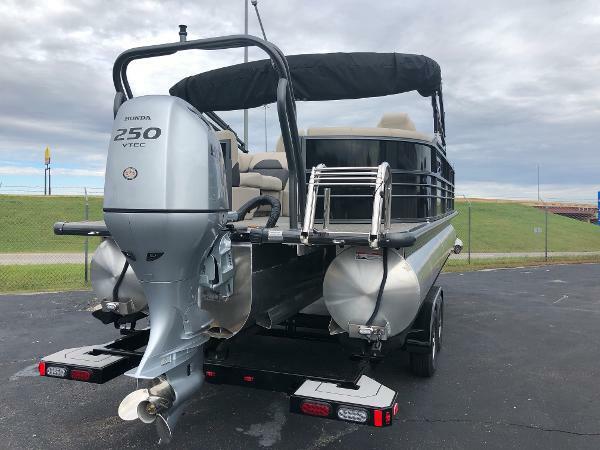 Boat features include: High Performance Toon Upgrade In-Floor Ski Locker Raised Helm Blackout Edition w/Hammered Skirting and Trim Salt water package Hydraulic Power Assist Steering Honda BF250XA Motor w/Stainless Prop Full Cover Bimini Top Custom Boatmate Trailer 10 YEAR WARRANTY!!! Call today to set up your demo. Trades welcome & Financing available!